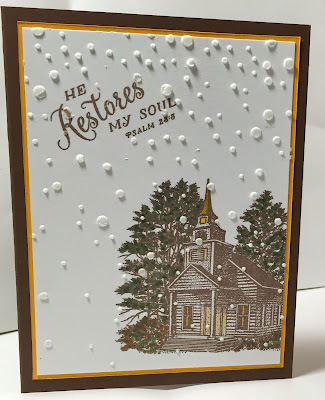 I recently got this Bible verse and had a Church from Stampscapes so decided to combine them. I thought I would add some snowflakes using embossing paste and a stencil. Not sure I would add them again or at least not as many. I did very little coloring on this. Also wanted to pop in to say Happy New Year to all! Be safe but have fun!! This is beautiful Sheri - I like the "snowflakes". Happy new year my friend! It looks like The Little Brown Church in Nashua IA. Very nice! Love the stencil overtop!! Looks chilly!! LOL! Great card, Sheri! Love the church and the snowflakes. Happy New Year! Hi Sheri! Your card is so. Eautiful with the extra snow, love the sentiment ,the church and the warm glow you gave this inside. God bless!